Poe created a new form of psychological tale in which the character's descent into madness becomes the central theme. In spite of his numerous contributions to lyric poetry, science fiction, and mystery, Poe's reputation as the master of the macabre remains secure. More than merely continuing in the tradition of Gothic literature with its roots in the British Horace Walpole and the German E. T. A. Hoffman, Poe replaced the supernatural element in Gothic literature with the demons of the character's tormented imagination. Poe discarded the moral lesson, the happy ending, and the theme of virtue rewarded in favor of creating an emotional impact on the audience. He brings the reader into the mind of the insane and, decades before Sigmund Freud, explores the darkest recesses of the subconscious. 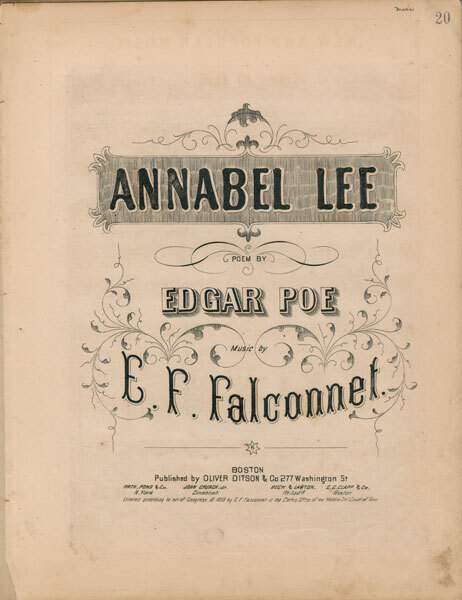 Born in Boston on 19 January 1809, Poe was the son of actors Elizabeth ("Eliza") Arnold Poe and David Poe. At that time the acting profession was still considered immoral. For part of Poe's childhood, acting was banned in his hometown of Richmond, where as a child he bore the stigma of having been the son of "players." 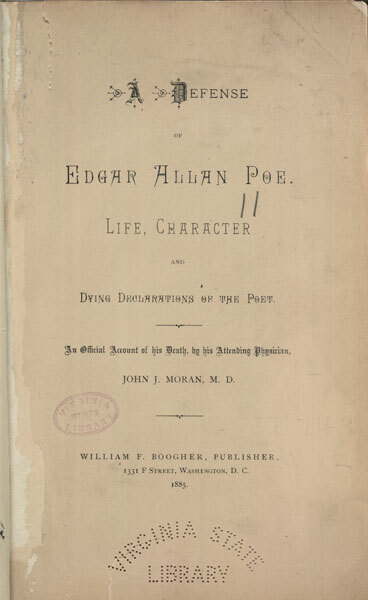 John M. Carter noted that despite Poe's being the ward of a prominent Richmonder, one of Poe's classmates "held himself too high to associate with the son of an actress and a pauper, and let the high-strung [Poe] understand it." 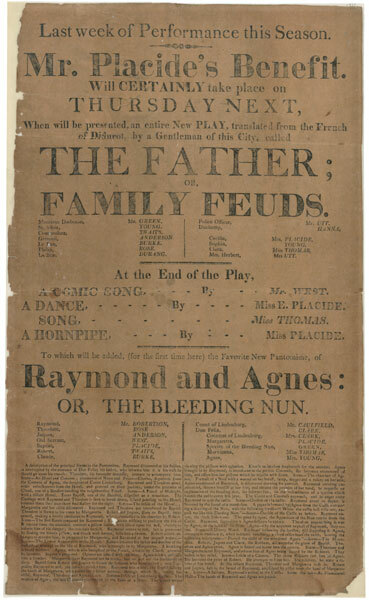 Making her American stage debut in Boston in 1796, Elizabeth Arnold performed more than two hundred roles in theaters from Boston to Charleston. Norfolk, Richmond, and Alexandria were regular stops for companies. Abandoned by her husband, David Poe, who she married in she was left with three young children. When Eliza Poe died in Richmond on 8 December 1811, at age 24, she was buried against the east wall of the cemetery at St. John's Church because her profession prevented her from being buried near the respectable citizens. "Nobody Coming to Mary Me, as sung by Eliza Poe." 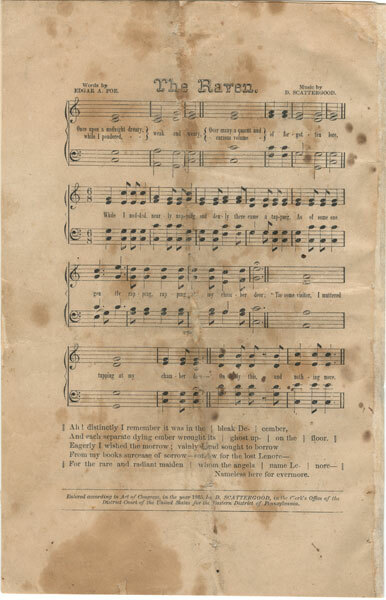 Published in The American Star; Being a Choice Collection of the Most Approved Patriotic & Other Songs. Richmond: Peter Cottom, 1817. Library of Virginia. Last week of Performance this Season. Mr. Placide's Benefit.. Broadside. Richmond. Library of Virginia. Poe used the sounds of words, and sometimes made up words, to create his poetry. 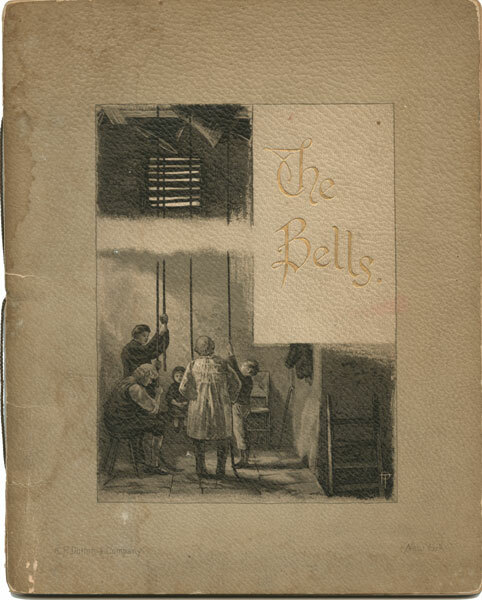 "The Bells". Philadelphia, 1881. Bound volume. Library of Virginia. 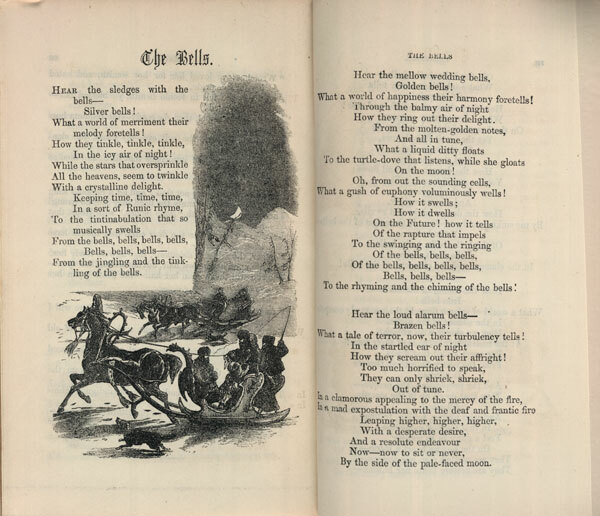 "The Bells""The Bells"
First published shortly after Poe's death, "The Bells" is one of Poe's most popular poems and is considered one of the finest uses of onomatopoeia in American poetry. 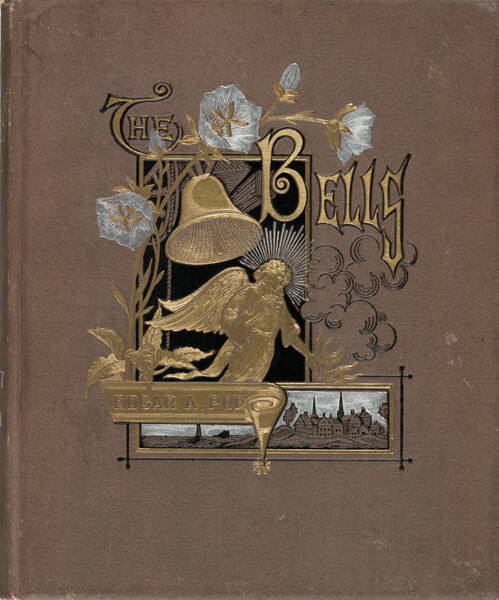 Less well known is the fact that this poem is the first use in the English language of the word "tintinnabulation,", meaning the ringing or sounding of bells or a jingling or tinkling sound as if of bells; one of about a thousand words that Poe invented. Poe's poems inspired artists and musicians alike. Annabel Lee. Words by Edgar Allan Poe. Music by Eugene Frederic Falconnet. Ca. 1859. Boston: O. Ditson & Co. Library of Virginia. The Raven. 1865. D. Scattergood, composer and illustrator. Library of Virginia. In Poe's day, poetry was written to be recited as well as read. Authors like Poe and Charles Dickens drew large audiences for readings of their work. Poe could earn one hundred dollars in one night for reading his poetry. In the last years of his life, he performed in the major eastern cities. Eighteen hundred people attended one of his readings in Massachusetts, and newspapers frequently praised his dramatic recitations. One witness, Susan Archer Talley, later wrote that at one of his performances the servants fled the room in terror. Not everyone enjoyed Poe's writings or dramatic performances. Ralph Waldo Emerson dismissed him as the "jingle man" whose works lacked any moral lessons. Poe, on the other hand, believed that a poem or story succeeded only if it was able to create an emotional impact on its reader. Poe thought that the sounds and rhythms of his poetry reflected emotional states. For example, he thought the letter "O" sounded melancholy, so he repeated the word "nevermore" throughout his poem "The Raven" in order to enhance the mood. In a time when there were no radios or televisions or films or video games, people turned to theater for entertainment. Poe achieved rock-star status as a poet and lecturer. Asked by Rufus Griswold to provide an autobiography for an article in the anthology The Poets and Poetry of America, Poe supplied an embellished life history. He deliberately distorted the facts to make his life sound more interesting than he thought it really was. He began by lying about his age and claiming that he had graduated with "highest honors" from the University of Virginia. His account of traveling to Europe to fight the Greek Wars of Independence and his subsequent imprisonment in Saint Petersburg was purely fictitious. 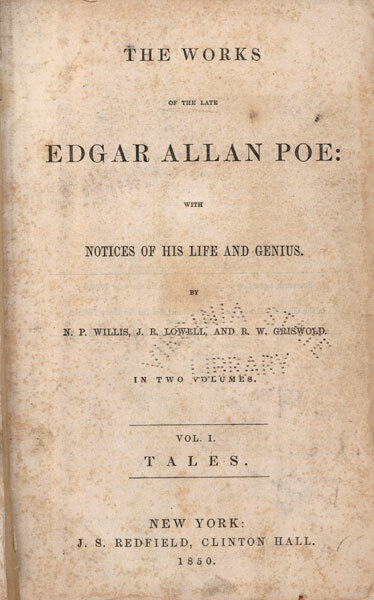 Griswold used Poe's autobiography again in a biography of Poe written after the poet's death. Poe left Richmond for the last time early on the morning of 26 September 1849 en route to Philadelphia, but he disappeared for five days. He was discovered in a Baltimore tavern dressed in ill-fitting clothes so unlike his usual dress that some people assumed that his clothes had been stolen. Poe spent his final four days delirious in Washington College Hospital under the care of Dr. John Moran, who later attributed Poe's death to the vague term "nervous prostration." The newspapers offered varying accounts of Poe's death, and, eight years later, a published account theorized that Poe had been murdered. There was no evidence of a crime, but it became one of several conspiracy theories associated with Poe's mysterious death. The Works of Edgar Allan Poe. Edited by Rufus Griswold. 1850. Library of Virginia. Poe's first posthumous biography was this libelous account written by his literary executor, Rufus W. Griswold. Although Griswold and Poe had personally disliked each other, Poe's mother-in-law. Maria Clemm, engaged Griswold to act as Poe's literary executor and to compile Poe's works into a single volume. At the time she did not realize the extent of Griswold's dislike of Poe. The brief biography, which appeared in volume three of Griswold's anthology of Poe's works, portrayed Poe as a drunken madman devoid of morals. Perhaps Griswold expected conservative America to dismiss Poe and his works, but, after the appearance of the memoir, Poe's complete works sold out in three editions in one year—better than any of his books had sold during the author's lifetime. Edgar Allan Poe: A Defense. John Moran. 1885. Library of Virginia. Dr. John Moran, the attending physician at Poe's death in Washington College Hospital in Baltimore, believed that Griswold's biography treated Poe unfairly. Nearly forty years after Poe's death, Moran answered Poe's critics and defended the writer's reputation. Moran's descriptions of a sober Poe reciting poetry on his deathbed challenged the common view of Poe dying drunk in a gutter. By the time Moran wrote this book, the temperance advocate Joseph Snodgrass had lectured throughout the country in an effort to discourage the consumption of alcohol by portraying Poe's death as the result of a drunken debauch. In contrast, Moran states that Poe neither smelled of alcohol nor appeared to have been drinking. Although he was present at Poe's death, Moran's fanciful descriptions of Poe deathbed recitations bear no resemblance to Moran's own accounts written at the time of Poe's death, so this positively biased book is considered no more accurate than Griswold's negatively biased view. Poe and His Critics. Sarah Helen Whitman. 1865. Library of Virginia. A one-time fiancée of Poe, Sarah Helen Whitman wrote this book to challenge the image of Poe popularized by his first biographer Rufus Griswold, as an amoral drunk, although Whitman herself had broken her engagement to Poe because he had failed to abstain from drinking. Her account depicts the Poe she had known as a refined gentleman. 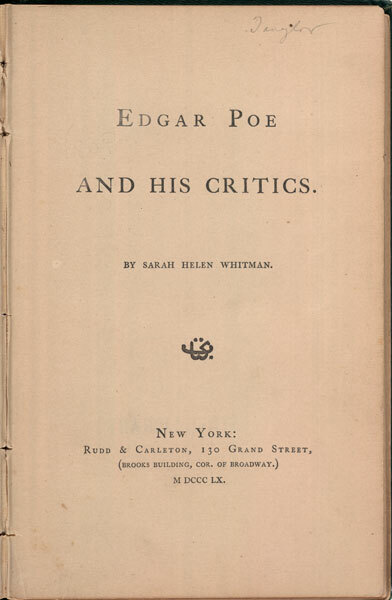 Although many who knew him personally had similarly positive opinions of his character and intelligence, this book did little to dispel the negative image of Poe already embraced by the public.